I actually meant to pop up this post a little while ago but as usual, work, social life and now Game of Thrones (I've managed 12 hours in four days people!) have got in the way of that. But enough of my excuses, let's get into it! I want to briefly outline what the app is and it's potential impact on the blogging world, I'm sure I could write an essay on it but I've kept it pretty concise! Have you been hearing about this little thing called Periscope? Heard people talk about it, seen tweets about it and vaguely recognise the logo above? It's made a pretty big impact in a small amount of time and that's largely because it's owned by Twitter. Therefore, there is a big push behind it and the Twitter and Periscope apps are well-integrated with one another. 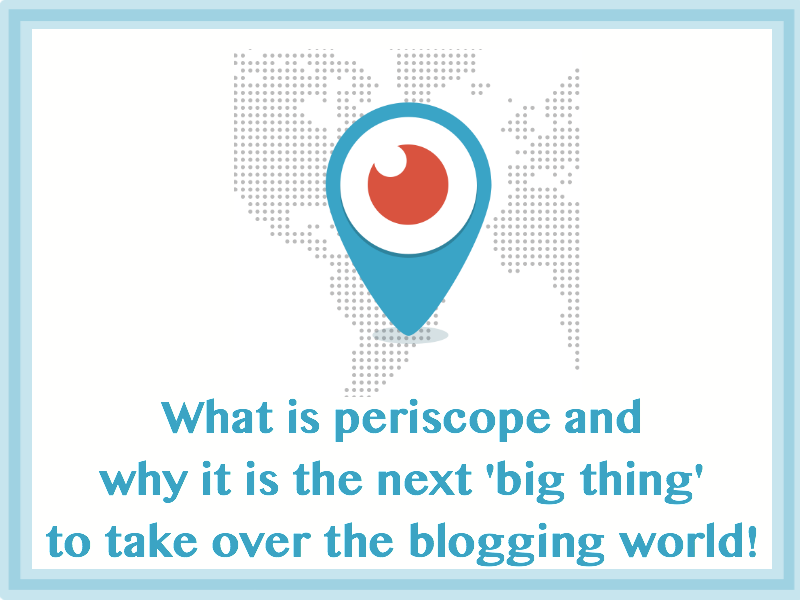 So, what actually is Periscope? Well, it's live video streaming, think along the lines of a live snapchat that people can like and comment on in real time, with no time limit (I don't think anyway). You have the option to upload your 'broadcasts' after you've finished recording so they are able to be viewed (and liked) for 24 hours. Anyone is able to watch your live streams, whether that is through the app or via web, although the latter option means you are unable to like and comment as you are not logged in. It's pretty addictive actually! It's a very strange feeling talking to people instantly and having them interact with you, I can really see it getting bigger and becoming a more integral part of the journalism/blogging world. How do you set up an account? This is very simple, especially if you already have Twitter. You just download the Periscope app, log in with your Twitter details and go! All of the people you are following that are on Periscope will be there and you can choose to follow them as well as some of Periscope's 'most loved' - essentially the most followed people on the app already. Pros of Periscope. I LOVE how instant Periscope is, you can connect with some many people so fast. It's essentially live vlogging, very cool (and a little scary!) for vloggers. I love it as a form of vlogging because it is so raw and unedited, something you rarely see nowadays. You also feel 'closer' to the person broadcasting because you are literally seeing them as they are in that moment in time and can communicate with them. I literally found this a little mind-blowing at first, I remember tuning in to watch Davina McCall in her home and saying hello to her, weird! Cons of Periscope. The biggest con for me is the need for a decent internet speed/connection. I find it hard enough as it is when I'm on the go sometimes, plus with streaming you can pretty much guarantee your data allowance to sky rocket if you get really into it and are a frequent broadcaster/viewer. Also, you cannot moderate comments. Clearly there isn't much that can feasibly be done here, I've had to block a couple of people who said inappropriate things mid-broadcast, totally took my attention away from what I was saying! Finally, the app hasn't been the most popular with live events. Having concerts, sport games etc streamed live can put companies in jeopardy who charge people to view. This happened a few weeks ago with a boxing match, people in the audience were broadcasting the event when there were many that had paid to view it. Periscope has been banned from certain events due to things like this. I'm trying to get into it but I'm still finding myself thinking will anyone watch that? I think I might get a stand and try some instant vlogs rather than youtube!